Erik Satie's Gymnopedie No. 1 is a well-known piece of classical piano repertoire from 19th century. Students of the piano will typically encounter this piece during their studies. This version has been adapted for guitar from the original music published in 1888. Some minor changes were made to make it “fit” the guitar. Chords were simplified, and in some cases non-melody notes were omitted. The result is a version that is reasonably easy to play on the guitar, without sacrificing the mood and character of the original composition. From the beginning, play until the end of 32. Now we see the instructions “To Coda”, so we skip to m40. Play from m40 to the end. Listen to a piano version to get a sense of the time and feel. The goal is to play very slowly and beautifully. Let note rings for as long as possible. Take advantage of ringing open strings to conceal chord switches. 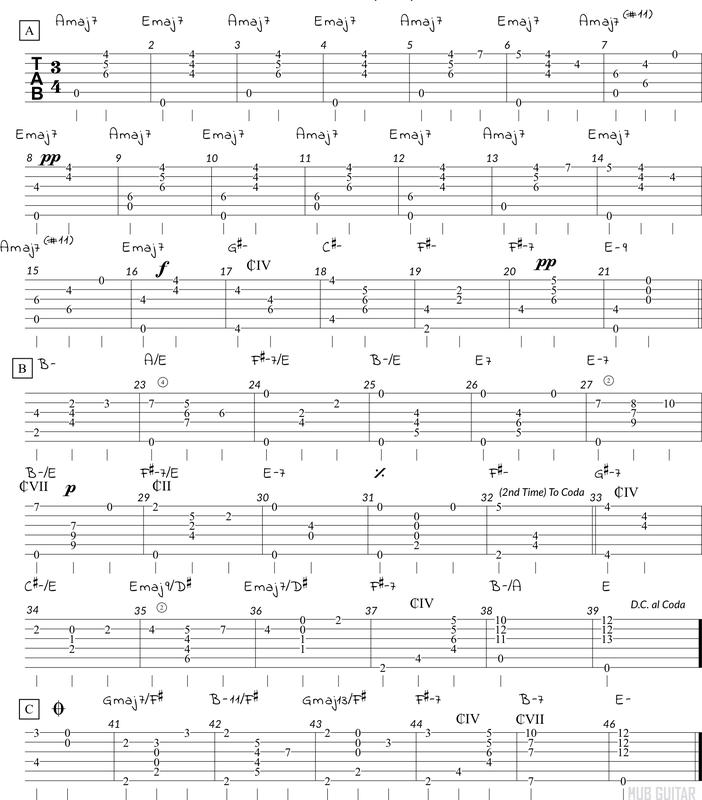 Being a highly expressive tune, the dynamics (f, ff, p) are open to interpretation. Starting from the first breath you take before playing measure 1, remind yourself: don’t rush. The easiest way to destroy this piece is to play it too fast.